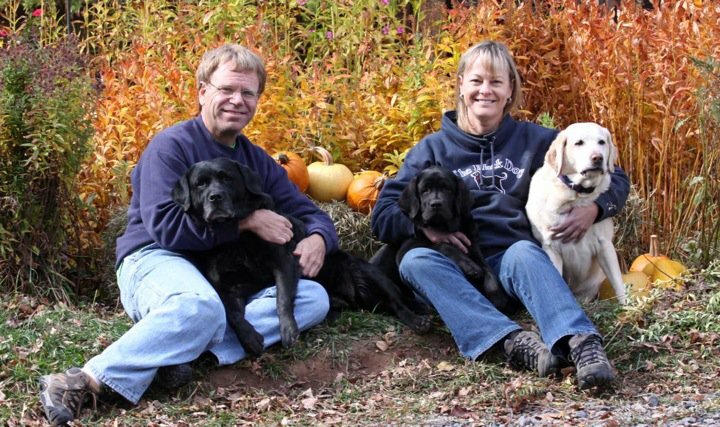 Started in 1993 because of Ellen and Larry Moon’s great love and high regard for the Labrador breed. Ellen, a certified vet-tech assistant, enjoys being the head nurse-maid and loves puppy whelping/care. Larry takes care of the housing logistics, loves to share training responsibilities for hunt and field along with the actual Hunt Test Competitions. This is not a place of large puppy breeding operation. Litters are raised in the Moon’s home with hands-on close supervision and stimulation. The owners consider Labs as family members and household companions (Labs like couching potatoes when not playing, training, or going for walks or adventures with their human friends).